JH1.FS3 is the duo of Frederikke Hoffmeier and Jesse Sanes. Though each figures individually in the now-generation of industrial noise—as Puce Mary and Liebestod respectively—JH1.FS3 delineates a more subtle “cinema of the ear.” Here, their words are spoken amidst a savvy re-assembly of 20th century avant-sonics: music concrète, technique extension, and pure electronic sound. 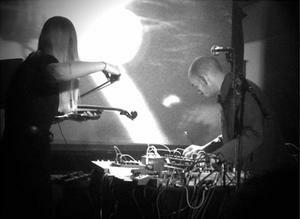 Their live sets, and recent album on Sweden’s iDEAL Recordings, utilize material they synthesized while in residence at Stockholm’s Elektronmusikstudion EMS and hi-res field recordings, which grant listeners entry to the inner zones of the pair’s private and artistic relationships.